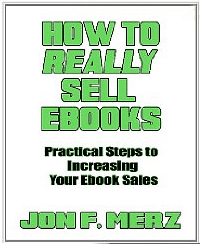 The ebook, How to Really Sell Ebooks, by Jon F. Merz, is a concise, detailed guide for marketing your ebooks through Amazon.com and Barnes and Noble by using Twitter to reach thousands of potential customers. His book is so concise that if I put many details into this review I’ll be stealing the author’s thunder. Suffice it to say that he recommends buying the application, TweetAdder, to build a large Twitter following, and also modifying your Twitter profile page, using its margins to advertise your recent publications. Even if you don’t plan to sell ebooks this little guide would be helpful to promote your blog or other website. Telemarketers seem to agree that Twitter is one of the best tools of this trade, and Merz’s ebook will get you started using that tool ably.